Friday, December 8th would have been Gregg's 70th birthday. In recognition of what would have been Gregg’s 70th birthday, there will be celebrations on the east and west coast Friday, December 8th. Macon, GA Mayor Robert Reichert has declared Friday, December 8th, 2017, Gregg Allman Day in Macon, a city Gregg often claimed as his own. 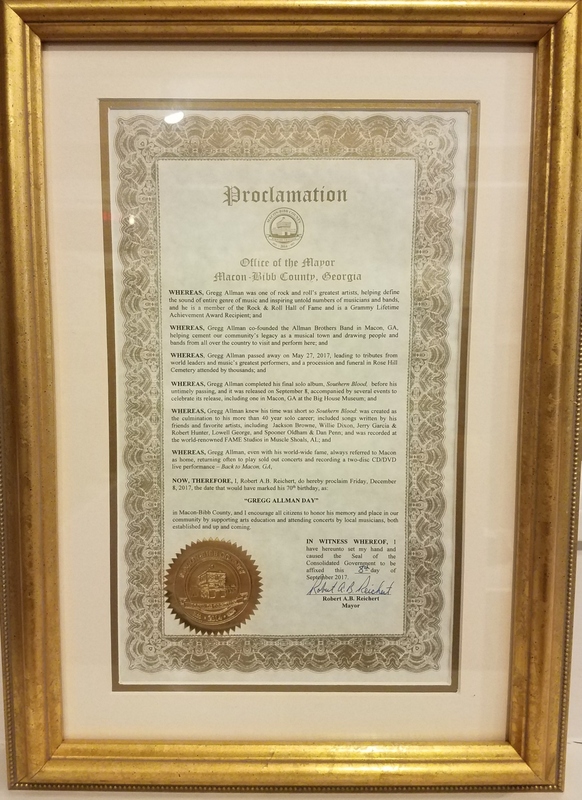 The proclamation was made during an tribute event in Macon at The Allman Brothers Band Big House Museum, on September 9th. The proclamation and a key to the city of Macon was received by Gregg’s son, Devon Allman who donated the honors to The Big House Museum. Along with the city of Macon, The Big House will be celebrating all day tomorrow with a reduced admission price of $8 to the museum and will be displaying a few extraordinary items from Gregg’s career including the original painting for the cover of Gregg’s 1973 solo release Laid Back. The items are on load to the Big House just for this special celebration of Gregg. Stop by if you are in Macon! On the west coast, Devon Allman will be celebrating his Father with a concert at The Fillmore in San Francisco. Devon is launching the ALLMAN / BETTS WORLD TOUR 2018 with a very special show at The Fillmore in San Francisco. 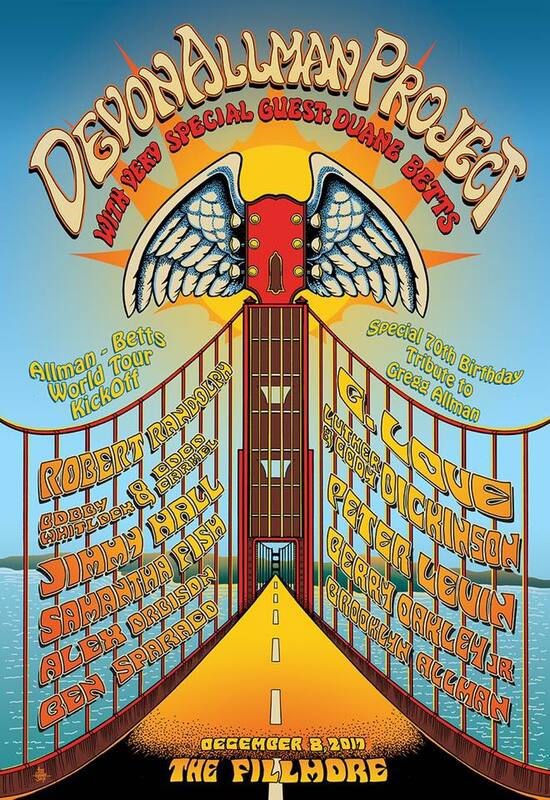 Devon’s new 6 piece band THE DEVON ALLMAN PROJECT will debut along with Duane Betts & many friends. Brooklyn Allman, Robert Randolph, Jimmy Hall, Luther & Cody Dickinson, Bobby Whitlock & CoCo Carmel, Samantha Fish, Peter Levin and more! Get tickets NOW if you haven’t already! And out of Nashville, Rounder Records released this amazing cut from Back To The Swamp: The Making of Southern Blood. The full documentary is available in the Deluxe CD/DVD for Southern Blood. Here Gregg’s guitarist and musical director, Scott Sharrard, talk about the writing and recording of “Love Like Kerosene” for Southern Blood.